With them being green (which always seems to go down well with guinea pigs), very water based and low in sugar, they should go down pretty well with my guinea pig. Needless to say they went down very well and was gone before I knew it. 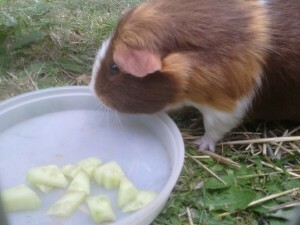 Guinea pigs love cucumber and it is commonly known as one of their favourite foods. Its pretty tempting to make them a regular part of their diet as they love it so much. But this isn’t a good idea, as too much cucumber is really too much of a good thing. Here are some facts about cucumbers and guinea pigs that I picked up which will help me in the future. Cucumbers are great for guinea pigs to eat. Guinea pigs absolutely adore them. It is appreciated in hot weather as it is very refreshing for them. Kind of like us drinking a cool glass of lemonade or eating an ice cream! It is a terrific water supplement and so will really help up their water intake. Because it is high in water content, too much can cause the guinea pig to feel bloated. Another reason they shouldn’t have too much is that it can also cause diarrhea. It doesn’t have a great deal of nutritional value and a lot of vitamin c content so shouldn’t be part of their everyday diet. It is more of a treat snack than anything. Can guinea pigs eat Cucumber skin? Cucumber skin is great for guinea pigs to eat, and they will really appreciate it as well. As with cucumber, not too much though and they will be fine. Can guinea pigs eat cucumber seeds? Yes, cucumber seeds are fine, just not too much. They are quite squidgy so will be fine for them to digest. Can guinea pigs have cucumber juice? No, steer clear of this as it will hurt their tummies. Their regular drink should be fresh water only. Verdict- can guinea pigs eat cucumbers? Cucumbers are definitely a treat for my guinea pig, but only once or twice a week to protect his tummy. He absolutely loves them! I scrap the seeds out of the cukes for mine. I do that for myself too. That way you don’t burp. My guinea pigs names r izzy and buttercup ? They LOVE to eat and tear up their cage ? My dog is scared of them and wants to eat them ?